The Hukilau tops this week’s news with updated info on event passes, Tiki Tower Takeover bartenders, and Marina the Fire Eating Mermaid’s swim shows. 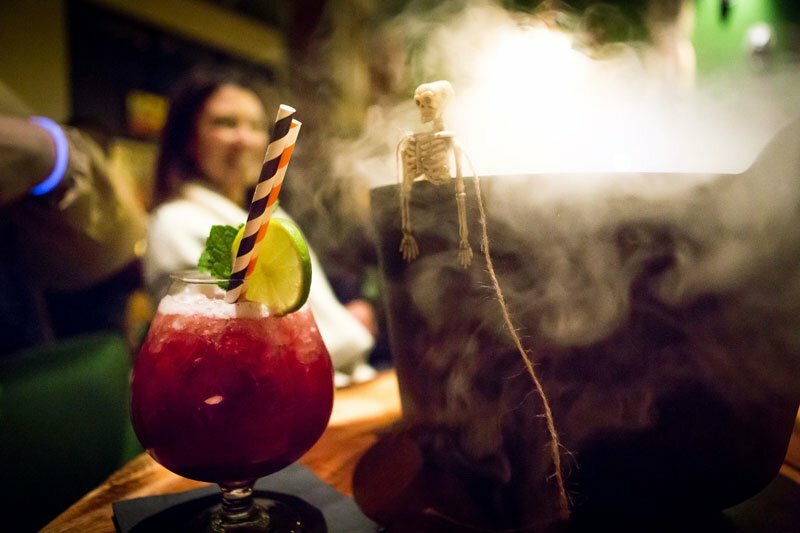 October was jam-packed with Halloween events, plus a Tiki cocktail showdown in New York City. There’s sad news on the loss of a Tiki landmark, plus quick hits on an exclusive Mai-Kai serigraph, Martin Cate’s new San Francisco bar, UK RumFest, and a new venue for Tiki Kon in Portland. Regular features spotlight lowbrow artist Pooch; rockabilly band Slip and the Spinouts; The Shameful Tiki Room in Vancouver; and the Shag the Store website. The Rum of the Week, Appleton Estate 12, is featured in Martin Cate’s Pampanito. The Hyatt Regency Pier 66 hotel’s main tower features a revolving ballroom on the 17th floor, the site of two special events at The Hukilau. Weekend passes for The Hukilau 2016, which went on sale Oct. 27 at 2015 prices, are off to a roaring start. On Monday, Nov. 9, organizer Christie “Tiki Kiliki” White announced that the highest level pass had already sold out, and another was getting close. White also revealed two returning participants in the Tiki Tower Takeover, plus the return of Marina the Fire Eating Mermaid in a possibly expanded Wreck Bar. The top-tier South Seas Pass is no longer available, White said, and you’re urged to act fast if you want a Big Kahuna Pass. Both of these passes include access to events on all five days of the event, scheduled for June 8-12 at the Hyatt Regency Pier 66 hotel and The Mai-Kai restaurant in Fort Lauderdale. There are plenty of four-day Aloha and three-day Luau passes available, White points out. The reason five-day passes go quickly is because of the relatively small capacity of The Molokai lounge at The Mai-Kai, site of Wednesday’s opening-night party. But it should also be noted that there is plenty of room in the rest of The Mai-Kai, so guests shouldn’t be shy about making plans to attend all five days of festivities. Through the end of the year, general passes are priced the same as they were last year: $155 for the Big Kahuna Pass, $130 for the Aloha Pass, and $115 for the Luau Pass. If you buy your pass now, you’re also given exclusive early access to buy tickets for two special events that are expected to sell out: the Tiki Tower Takeover and Shag’s SkyLounge. Introduced this year, the premium South Seas Pass ($349) covers all five days of the event, plus VIP access to the Tiki Tower Takeover including early entry to meet the bartenders, a ticket to Shag’s SkyLounge, special seating at The Mai-Kai during the June 11 dinner shows, plus a special Pier 66 Tower Barrel Mug by Eekum Bookum. Guests can also make their room reservations now at the landmark Pier 66 hotel, which dates back to 1956 and includes a mid-century-styled 17-story tower added in 1965. Special rates (based on double occupancy) for The Hukilau are $129 for a marina/pool view, $149 for the tower, and $169 for a tower junior suite. Pier 66 guests will receive a welcome bag full of sponsor products, plus they’ll have easy access to The Hukilau’s many events in the hotel’s ballrooms and Pier Top Lounge. 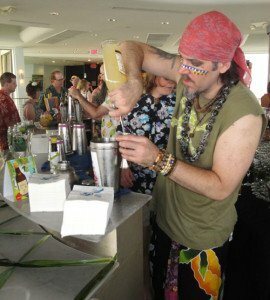 One of the signature events in the Pier Top Lounge is the second annual Tiki Tower Takeover, which will now include all four participants from last year’s inaugural cocktail party. White announced that Brian Miller (“Tiki Mondays With Miller”, New York City) and Paul McGee (Lost Lake, Chicago) will be back mixing signature cocktails along with the previously announced Jeff “Beachbum” Berry (Latitude 29, New Orleans) and Martin Cate (Smuggler’s Cove, San Francisco). Two more top Tiki bars will be announced soon, providing guests with six cocktails in addition to hors d’oeuvres and special musical entertainment on Thursday, June 9, from 5 to 7 p.m. Tickets are $69, available now to passholders. Later on June 9, the scenic revolving lounge will be transformed into Shag’s SkyLounge, a special event hosted by artist Josh Agle, aka Shag. From 10 p.m. to midnight, guests can step into a Shag painting for a “Martini meet and mingle” in a mid-century-themed paradise, complete with live Bossa Nova music. Dress as your favorite Shag character and you could win prizes. Passholders can buy tickets now for $49. Tiki Kiliki has also confirmed that Marina the Fire Eating Mermaid (MeduSirena) and her acclaimed swim shows at the nearby B Ocean Resort will once again be included in The Hukilau festivities. Marina and her pod of aquaticats will perform several underwater shows exclusively for guests of The Hukilau in the iconic Wreck Bar, which dates back to the hotel’s original incarnation as the Yankee Clipper in the 1950s. Guests will also be in for a special surprise at the nautically-themed Wreck Bar, which offers porthole views of the mermaids performing in the resort pool. Marina reports that the bar will be undergoing a restoration that will return it to its vintage glory, offering even better views of her famous choreographed shows. Two original portholes that were sealed off decades ago will be uncovered as the bar is extended, Marina revealed. The portholes are located on the right side of the bar, the site of a now-closed prep room. Plans call for the bar to continue to operate throughout the renovation. 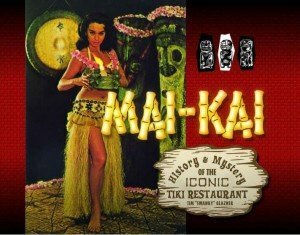 The 2016 event will celebrate the 15th anniversary The Hukilau, the East Coast’s premiere Tiki weekender, and the 60th anniversary of The Mai-Kai, perhaps Polynesian Pop’s most revered mid-century restaurant. 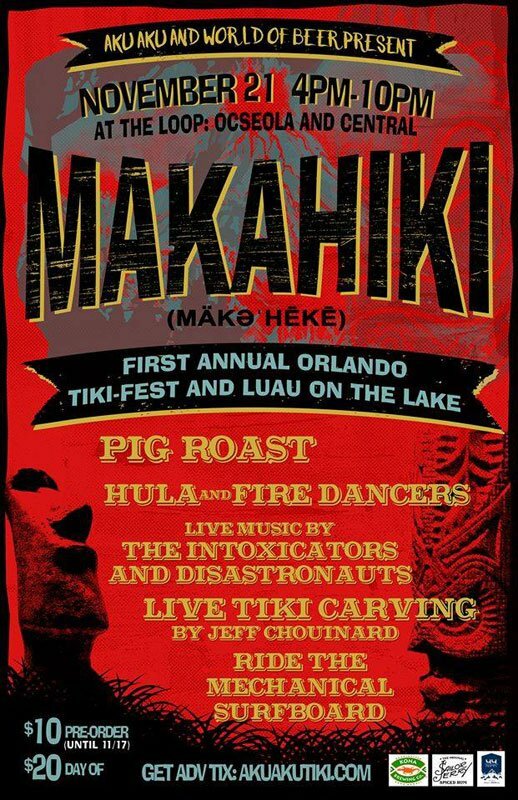 It will include Shag’s first-ever symposium at a Tiki event, some of the scene’s top exotica and surf bands, a wide selection of expert symposiums (including historians Sven Kirsten and Humuhumu), rum-tasting booths, dozens of artists and vendors, a memorable night at The Mai-Kai, plus more. The full entertainment lineup will be announced in early 2016. 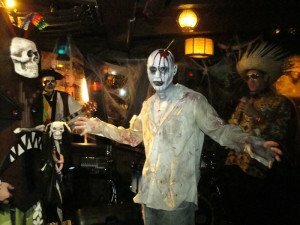 The living dead came out in full force on Oct. 30 at The Mai-Kai in Fort Lauderdale, filling The Molokai bar with creative costumes and partying to the rockabilly sounds of Slip and the Spinouts for the seventh annual Hulaween. The band kept the party lively, performing for the fifth time at the annual Halloween bash. The dance floor filled with swing dancers almost immediately as the band cranked out an endless set list of classic rockabilly, roots, and rock ‘n’ roll, plus a number of well-received originals. [See Band of the Week profile below] The “Night of the Zombie” theme was celebrated by the undead revelers, who also enjoyed a special Appleton Zombie cocktail. The highlight, as usual, was the costume contest featuring dozens of creations that ranged from creepy to kooky. Cash and prizes were provided by Appleton Rum and other sponsors, including The Hukilau. Trader Sam’s Enchanted Tiki Bar at the Disneyland Hotel hosted its second annual Mahaloween parties on Oct. 12 and 13, featuring themed merchandise and entertainment, food and drinks, and that special Disney touch. … Forbidden Island in Alameda, Calif., got into the Halloween spirit with five nights of Halloween events from Oct. 27 to 31, including a showing of classic movies, four distinctive DJ nights, and a live theremin performance. … The flagship Trader Vic’s in Emeryville presented a special Hulaween Cocktail Workshop on Oct. 30, with “devilish delicacies” and tips on “spooky mixology.” … Longitude in Oakland celebrated “Zombies! Zombies! Zombies!” on Oct. 30 with an all-Zombie cocktail menu featuring versions from past decades, and an undead costume contest. … The Curse of the Tiki Variety Show took over Don the Beachcomber in Huntington Beach, Calif., on Oct. 30, featuring performances by The Hula Girls and The Jimmy Psycho Experiment, a costume contest, sideshow and burlesque performers, and much more (related coverage). 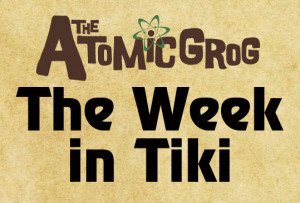 Lucky Joe’s Tiki Room in Milwaukee went out with a bang on its closing weekend with an Oct. 30 Spook-Tiki-Ular party featuring live surf music from The Revomatics. … Because everything is bigger (and weirder) in Las Vegas, The Golden Tiki hosted a Mad Monster Party Weekend on Oct. 30-31 with live music from “voodoobilly” band Deadbolt, DJ Skyler Gilmore, a costume contest, and guest of honor Carrot Top’s shrunken head. 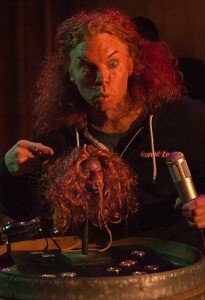 The disturbing visage was unveiled on Oct. 29 in a ceremony featuring Carrot Top himself. 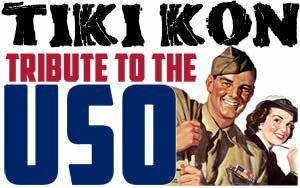 … On Halloween night, Tikiyaki Orchestra played the vintage Mayflower Club in North Hollywood, headlining the “Idols and Monsters” party that also featured a costume contest, artists and vendors, Tiki cocktails, three premiere DJs, and more. … Trader Vic’s in Portland honored Warren Zevon’s classic song lyric (“I saw a werewolf drinking a Pina Colada at Trader Vic’s”) on Oct. 31 with a party featuring werewolf costumes, Pina Coladas, and ghoulishly green Monster Mai Tais. And if you couldn’t make it out of the house for any of the parties, a couple cool online radio stations had you covered. Tiki Brian of the Exotic Tiki Island podcast presented the Mahalloween Spooky Luau, 48 hours of Halloween-themed exotica and Tiki tunes streaming on ETI Radio beginning at 9 a.m. on Oct. 30. Meanwhile, Surf Rock Radio presented a Halloween Surf Party from 7 p.m on Oct. 30 to noon on Nov. 1, streaming a continual assault of creepy vintage surf and instro music. St. John Frizell presents the White Zombie at The Art of Tiki: A Cocktail Showdown Oct. 17 at the New York City Wine & Food Festival. When celebrity chef Emeril Lagasse reprised “The Art of Tiki: A Cocktail Showdown” on Saturday, Oct. 17, during the New York City Wine & Food Festival, it was a far cry from the inaugural bartender battle held last February at a beachside hotel during the South Beach Wine & Food Festival. A million miles from SoBe, this night was pure NYC, from the rooftop locale to the frigid temperatures. So it was fitting that St. John Frizell, owner-operator of Fort Defiance in Brooklyn, won the contest with a defiant frozen drink. 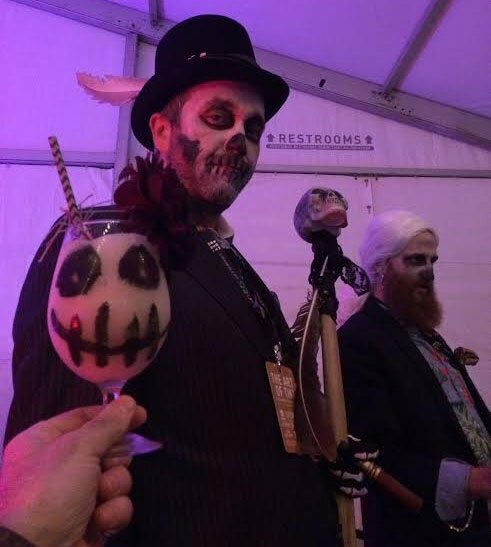 “It was a freezing cold night, so obviously a frozen drink had to win,” said one of the judges, Tiki cocktail author Jeff “Beachbum” Berry, also owner of Latitude 29 in New Orleans. Frizell wore full Baron Samedi makeup as he presented the drink, Berry reports. Frizell and the Fort Defiance White Zombie edged out several strong competitors, most notably Garret Richard of The Happiest Hour in New York City, who nearly swayed the judges with his presentation alone. 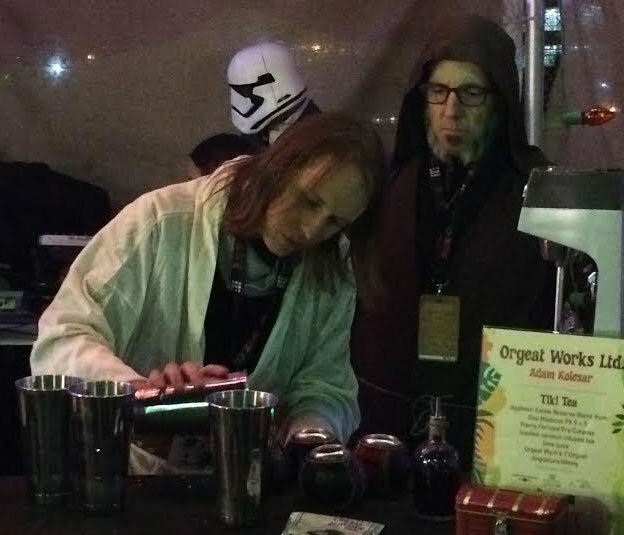 Sponsor Adam Kolesar and Orgeat Works brought in Jimmy Psycho to help re-create the Mos Eisley Cantina from Star Wars for Richard, whose drink was the Tiki Tea, a riff on the Mai Tai. Joaquin Simo of Pouring Ribbons in New York City also put up a valiant fight with a twist on a traditional shaken Daiquiri called the Native Dancer. “The presentations by everyone were really on point,” said Brian Miller of “Tiki Mondays With Miller,” who sat in a judge’s seat after winning the South Beach showdown earlier this year. Garret Richard mixes up the Tiki Tea under the watchful eye of Adam Kolesar in the Orgeat Works Cantina. The NYCWFF showdown, presented by Cocktail Kingdom, also included Matthew Belanger of Donna (Brooklyn), Diane Corcoran of Three Dots and a Dash (Chicago), Natalie Jacob of Dutch Kills (Long Island City), Ryan Kahl of Pacific Standard (Brooklyn), KJ of Flatiron Lounge (New York City), and Sofia Present of End of the Century Bar (Queens). Tickets are on sale now for $95 at SoBeFest.com or by calling (877) 762-3933. 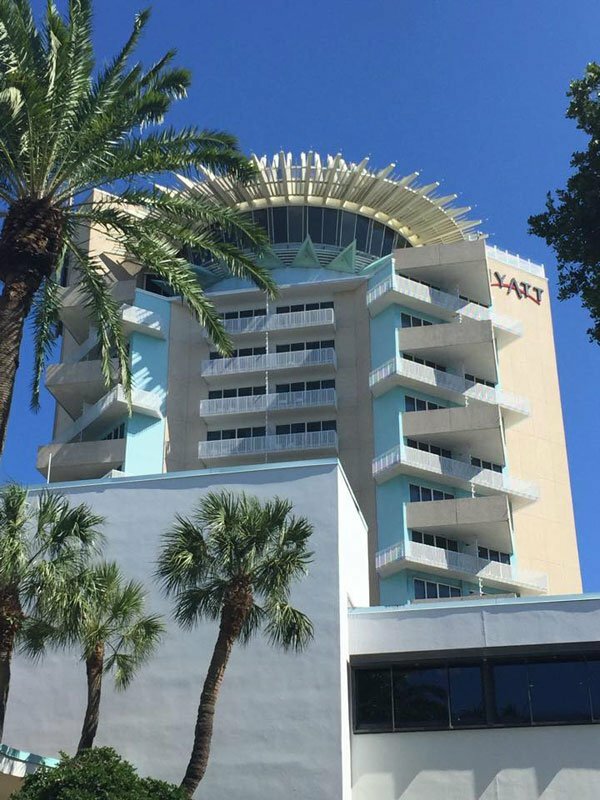 A classic mid-century Polynesian-themed hotel that has been on a slow, steady decline for years is finally being put out of its misery by way of a wrecking ball. The Palm Beach Oceanfront Inn – the former Palm Beach Hawaiian Ocean Inn that was featured in Sven Kirsten’s Tiki Pop book and exhibit – is being torn down after sitting vacant for more than a year. Demolition began on the beachfront property in South Palm Beach on Oct. 21. In the early morning hours, “the heavy metal bucket of a Volvo track hoe excavator smashed through the red-tiled roof, stucco walls and wood frame of the beachfront section of the building,” according to The Palm Beach Post. The front section, including the iconic swept-up A-frame roof, “will come down around the first of the year, after reconstruction of the sea wall,” The Post story says. Opening in 1964, the Palm Beach Hawaiian lasted much longer than many of its old Florida brethren along the pricey beachfront. In later years, its iconic design became a favorite of mid-century and Tiki architecture buffs, landing it a spot in Kirsten’s exhibit in Paris. During its heyday, it attracted an odd assortment of B-list celebrities. According to The Post, among those who stayed there were singer and ukulele player Tiny Tim, anchorman Chet Huntley, and former Yankees manager Joe Torre. 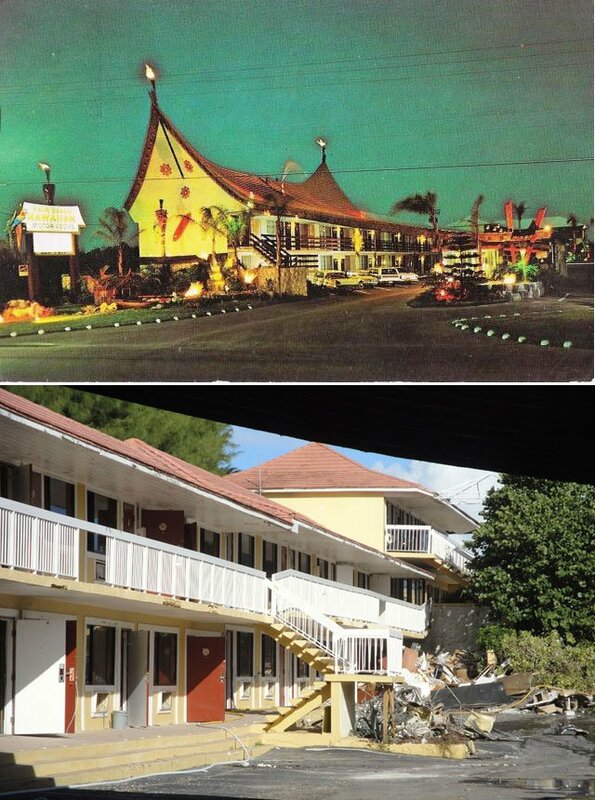 It was stripped of much of its Polynesian decor and converted into the Palm Beach Oceanfront Inn around 2002. The hotel was closed in September 2014 after the town approved plans to build 30 condo units on the 1.1-acre site. It was sold to the current owners for $8.25 million in November 2012. According to The Post, the 14-story “ultra-modern” condo should open in 2017 with units selling for around $3 million each. 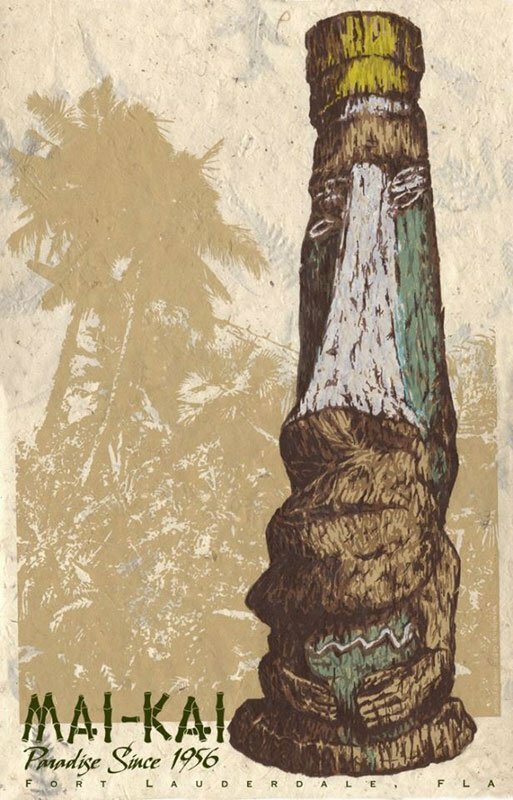 A new serigraph by artist Brian Potash pays tribute to a Tiki that has stood in front of The Mai-Kai for around half a century. Tiki artist Brian Potash of Devilfish Ink in Philadelphia appeared at The Mai-Kai in Fort Lauderdale on Oct. 27 and 28 for the release of his authorized, limited-edition eight-color serigraph honoring one of the historic restaurant’s iconic Tikis created by legendary carver Barney West. 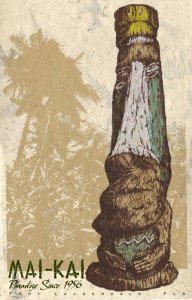 He produced 59 serigraphs, one for each year that The Mai-Kai has been open. Potash drew the eight color separation plates, printing them on handmade paper from India. 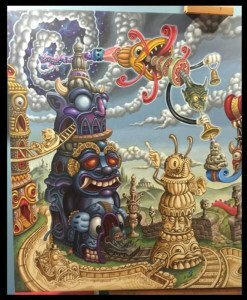 Prints are available in The Mai-Kai’s gift shop and at Devilfish Ink. 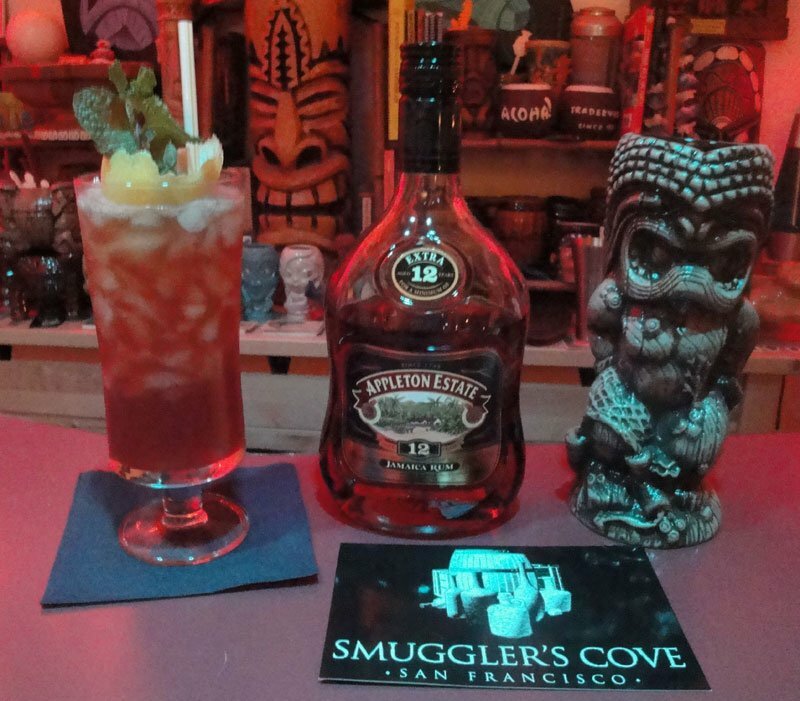 Rum expert and Tiki cocktail guru Martin Cate, owner of San Francisco’s acclaimed Smuggler’s Cove, is embracing another vintage spirit with the opening of Whitechapel. The bar/restaurant premiered Oct. 26 in partnership with Cate’s former bar manager, Alex Smith, and has already been hailed for its menu of 350 gins, 115 cocktails and “transportive” experience. Sarah Fritsche of the San Francisco Chronicle wrote: “The whole experience feels as if, rather than walking into a local bar, you had hopped in H.G. Wells’ time machine or stepped through C.S. Lewis’s magical wardrobe. However, instead of finding any Eloi or a White Witch, you’ll find yourself happily lost in a wonderful world of gin.” Whitechapel is Cate’s “crazy fantasy” of an abandoned London subway station in the 1890s turned into a secret gin joint. For some of Cate’s handiwork with rum, check out the Cocktail of the Week below. After mourning the loss of the Red Lion at the Quay in Vancouver, Wash., which closed over the Halloween weekend, organizers of Tiki Kon have announced a new host hotel for 2016. 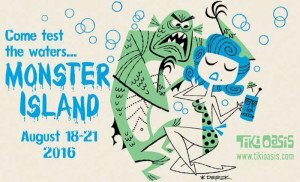 The 14th annual northwest Tiki weekender will be held July 8-10 at the Red Lion on the River in Portland, just across the Columbia River from the Red Lion at the Quay. The 42-year-old hotel was the event’s host for the past three years. It will reportedly be razed and the site redeveloped. Tiki Kon reports that the Quay Bar and restaurant will be dismantled, with the decor and artifacts moving to another Red Lion location. Organizers say the new hotel is twice the size with the same river views, nicer guest rooms, and more amenities. Get updates on Tiki Kon’s Facebook page. By all accounts, this year’s UK RumFest, held Oct. 17-18 in London, was the biggest and best ever. Helena Tiare Olsen of A Mountain of Crushed Ice filed a comprehensive report on her blog, complete with lots of photos. From the Rum University seminars, to the tasting sessions, to the cocktails, it looks like a ton of educational fun. A recent work in progress on 3-by-4-foot canvans, posted by Pooch on Facebook. The wildly creative, surreal artwork of South Florida’s Michael “Pooch” Pucciarelli is always called out during the Halloween season, but there’s no reason not to embrace his lowbrow style all year long. A much-in-demand tattoo artist, Pooch is also an accomplished fine artist whose paintings have been shown in galleries across the country and published in numerous books and magazines. 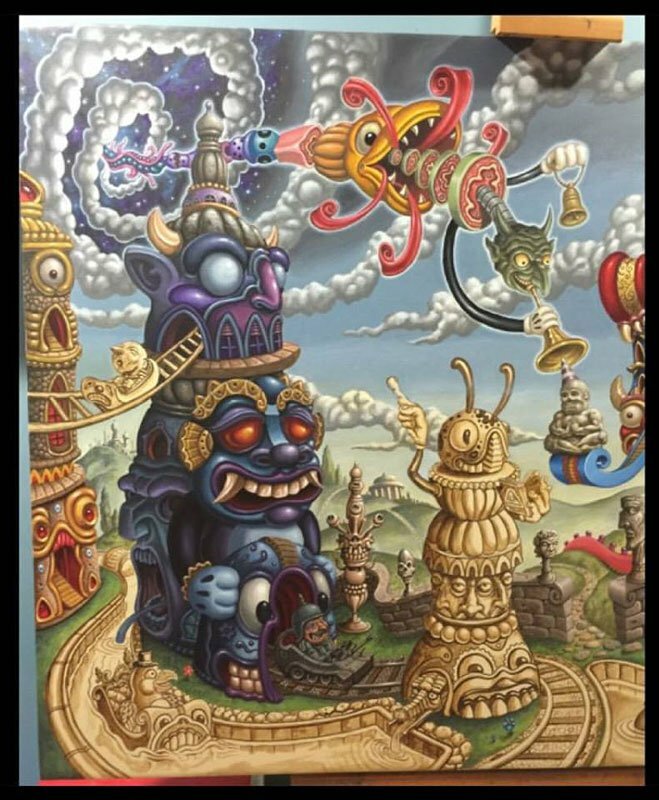 Pooch has been painting seriously for more than 15 years, gaining his early fame with a series of dark and whimsical pieces that depict otherworldly theme park rides inhabited by Tikis, skeletons and other exotic imagery. 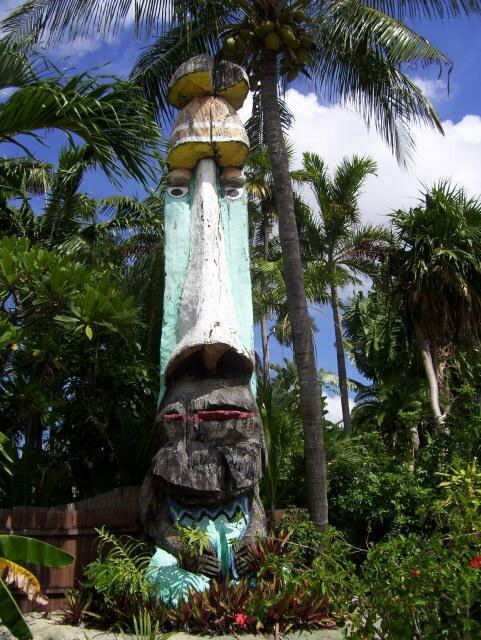 (His “Franken Tiki Island” paintings were the featured artwork at The Mai-Kai’s Hulaween parties in 2012 and 2014). The inventive Pooch Island website, which is themed in the style of an old-fashioned circus sideshow, includes an extensive gallery of his fine art, tattoos and other work. Commissioned work keeps him busy these days, but you can get your own Pooch via his robust online store that features limited edition prints, posters, books and lots of other cool items. Pooch will be celebrating the 20th anniversary of his Lake Worth tattoo shop, Altered State, in 2016. 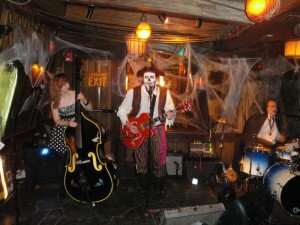 A veteran of the eclectic South Florida music scene, guitarist/vocalist Slip Mahoney has concentrated his efforts for the past 15 years on keeping roots and rockabilly music alive with his band the Spinouts and a non-stop performing schedule that includes regular gigs at Fort Lauderdale’s legendary Mai-Kai. The band covers an impressive range of styles (rockabilly, vintage rock, swing, surf, old-school country, and blues), appealing to a wide fan base. This enables them to play every conceivable bar and honky-tonk in Florida as well as high-profile events such as The Hukilau, Viva Las Vegas, and the WMNF Rockabilly Ruckus in Tampa. The bass and drum slots are filled by a revolving cast of highly capable musicians, giving the band a fresh look whenever you see them. While essentially a “cover band,” the Spinouts and Mahoney have an impressive repertoire of original songs, showcased on the Two Worn Out Boots album, released in the spring. The 15-song CD is available on the band’s website and at shows. You can also buy songs individually in the band’s download store. Catch ’em live: Slip & the Spinouts rocked the house during the seventh annual Hulaween on Oct. 30 at The Mai-Kai, the band’s fifth appearance at the event. Click here for more photos and recaps of all the past Hulaween parties. Check the band’s upcoming show schedule. 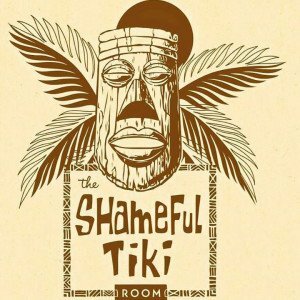 Undoubtedly the most authentic and highly regarded Tiki bar in Canada, The Shameful Tiki Room opened in March 2013 in a cozy 1,200-square-foot space in Vancouver and quickly established itself as the real deal (note those high Critiki ratings). Owner Rod Moore did his homework and created a perfect Polynesian oasis in the Great White North, featuring classic Tiki decor (Bosko carvings, lots of bamboo, float lamps, pufferfish, etc. ), and perfectly executed classic cocktails (Zombie, Jet Pilot, Mai Tai, etc.) plus originals such as The Day of the Dead. According to the official website, the decor was imported from around the world, including tapas cloth from Tonga and Fiji. The bar makes its own syrups (including falernum), and there’s a rum club with 50 varieties for connoisseurs to try, plus a signature mug. There’s also a kitchen that offers a few tasty small plates, plus an entertainment lineup that includes live surf and exotica music, and retro go-go dance shows (don’t miss The Hang-Ten Hangmen). The space is small, and only 50 people are allowed in at a time, allowing all guests to have a seat and enjoy the experience – a commendable policy that more bars should try. (Thumbs up to everything on the website F.A.Q.). With a commitment to high quality and customer service, The Shameful Tiki Room proudly upholds the tradition of the quintessential Tiki bar experience. Coming soon: The Shameful Tiki Room is scheduled to open an eastern outpost in Toronto on Nov. 19. Plans call for a three-day celebration with live music from The Hang-Ten Hangmen, rum tastings, and more. Get updates on the Facebook page. A new Shag print was released at the opening of a new store in West Hollywood on Nov. 7. If you can’t make it to Shag’s flagship store in Palm Springs (or the new location in West Hollywood), the Southern California artist’s virtual store is the next best thing. It features a wide selection of merchandise from Tiki’s most acclaimed artist, including prints, sculptures, coasters, pins, necklaces, glasses, pillows, mugs, and more. Many of the items are limited editions and exclusive to the store. You’ll find enough of Shag’s distinctive, retro-styled art and merch to make your pad the hippest in your town. Independently owned and operated, Shag the Store was designed by and in partnership with Josh Agle, aka Shag. Established in 2010, it’s the world’s only store dedicated solely to Shag’s fine art and merchandise. Don’t miss: Shag the Store opened a second brick-and-mortar location in Southern California on Saturday, Nov. 7. The grand opening of the new West Hollywood store featured gifts, giveaways, complimentary beverages and more. 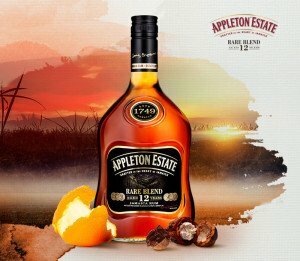 Don’t be confused by the rebranding of some of the elite rums from Jamaica’s venerable Appleton Estate brand, produced by the J. Wray & Nephew distillery and rum empire. These delicious premium rums remain the same, only the packaging has changed. Though Appleton Estate Extra is still on store shelves (I recently bought the bottle pictured below), it’s being supplanted by Appleton Estate Rare Blend. The distinctive bottle is also unchanged, so other than the expected name transition confusion, loyal consumers shouldn’t be affected. Extra/Rare Blend is aged 12 years in American oak barrels and blended by Appleton’s acclaimed master blender, Joy Spence. Recognized as the first woman to hold that title in the distilled spirits industry, Spence upholds the brand’s great tradition dating back to 1749 with this classic dark Jamaican rum. Complex fruit flavors mesh perfectly with charred caramel and brown sugar. Only mildly bitter, there are tons of mild flavors to entice the palate. On top of its notoriety as a classic sipping rum, Appleton Estate 12 is perhaps the world’s best premium mixing rum, as the recipes below will attest. Shake first five ingredients with 1 cup of crushed ice. Fill a tall glass with ice and seltzer water. Strain shaken ingredients into glass and garnish with a mint sprig and lemon twist. The Pampanito is named for the World War II submarine that’s designated a National Historic Landmark and is moored at San Francisco’s Maritime Museum, near Fisherman’s Wharf. Note that this recipe, cribbed from the video below, is a bit different than this recipe and others online. It’s a great showcase for the smooth and flavorful Appleton 12, which combines perfectly with the sweet/spicy molasses-allspice combo and the tart lemon. Everything works in perfect harmony, with the seltzer tempering (but not watering down) the strong spices and making the Pampanito go down way too easy. * Mixing notes: Allspice liqueur (aka allspice or pimento dram) is a potent Jamaican elixir made from allspice berries, rum, sugar and spices. St. Elizabeth is the most widely available brand. Molasses syrup is a signature Martin Cate ingredient used to great effect in drinks at his acclaimed Tiki bar, Smuggler’s Cove in San Francisco. There are several recipes floating around online, but I prefer this one. You can also find molasses syrup in Cate’s Formidable Dragon, which was featured at the Tiki Tower Takeover at The Hukilau 2015 in Fort Lauderdale. 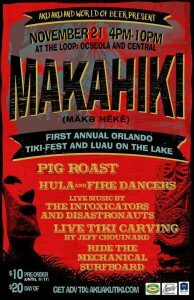 Don’t miss: Martin Cate will be mixing up a new signature drink at the Tiki Tower Takeover at The Hukilau in Fort Lauderdale in June 2016 along with Tiki bar luminaries Jeff “Beachbum” Berry (Latitude 29, New Orleans), Paul McGee (Lost Lake, Chicago), Brian Miller (Tiki Mondays With Miller, New York City) plus two more bars in the revolving Pier Top Lounge at the Hyatt Regency Pier 66 hotel. Get tickets now. This entry was posted in 2016, Art, Cocktails, Culture, Events, Events, Events, Events, History, History, Hukilau, Mai-Kai, Music, Recipes, Rum, South Florida, The Week in Tiki and tagged A Mountain of Crushed Ice, Appleton, Appleton Estate 12, Barney West, Beachbum Berry, Brian Miller, Brian Potash, cocktails, Emeril Lagasse, Fort Defiance, Fort Lauderdale, Garret Richard, Halloween, Hukilau, Hulaween, Jimmy Psycho Experiment, Joaquin Simo, Mai Tai, Mai-Kai, Marina the Fire Eating Mermaid, Martin Cate, Molokai bar, New York City, New York City Wine & Food Festival, Palm Beach Hawaiian Inn, Pampanito, Pier 66, Pooch, Pouring Ribbons, recipe, rum, Shag, Shag the Store, Shameful Tiki Room, Slip and the Spinouts, South Beach Wine & Food Festival, South Florida, St. John Frizell, Tiki Kiliki, Tiki Kon, Tiki Tower Takeover, Trader Sam's, Trader Vic's, UK RumFest, Whitechapel, Wreck Bar, Yankee Clipper, Zombie cocktail. Bookmark the permalink.